How does grass turn into milk? Scroll down and click on "Where does our food come from?" NB This American website uses some different food names, for example, eggplant and zucchini are used instead of aubergines and courgettes. 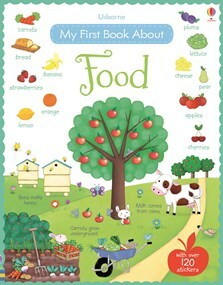 With over 120 stickers of common fruits, vegetables, fish, meats and other foods that help children learn in a fun, interactive way. Includes internet links to age-appropriate websites with games and activities. Also available as a hardback library edition with no stickers and with a contents page and index.